Life-of-Ryan: Little Ryan's Past: Just How Did Ryan Come to Live with Humans? You've always remembered your Bear Mom, Ryan. 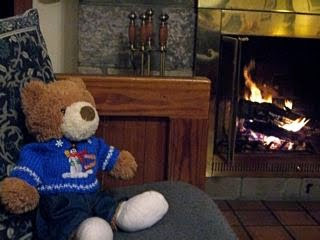 Remember when we stayed overnight at the Bear's Den Lodge on the Appalachian Trail in Virginia? You asked your Mommy and me about your Bear Mom then. Yeah, I remember, that day, Daddy. 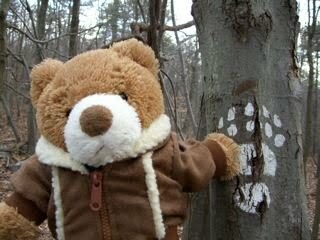 We saw really big Paw-Prints on the Trees. I Remember Asking, "Mommy?" "Is this my Bear Mom?" Remember–– I've told you before that your Mommy and I were not there when you were a Tiny Cub and you were living with your Bear Mom; a Park Ranger who we knew told us the Story about you and your Bear Mom. Now, it is True that no one can know Exactly what happened, Ryan. However, our Friend, Ranger Jane, is Very Knowledgeable about the Forest where she works and she is Skillful in Using Forest Signs that she Sees to Help Her Understand what 'may have taken place'. One Bright Spring Morning at about 10 O'clock, on the day after a Fierce late-April Storm had blown through the Forest where we often Hiked, we noticed our Friend, Ranger Jane walking down a Wet and Muddy Trail alongside the Big Lake. She was Clutching Something Close to her Chest– it was a Faded Green Woolen Army Blanket. Now, Ranger Jane was looking down at what she was carrying in her Arms and she Was Startled when she heard us Call Out to her–– "Hello, Ranger Jane!". She jumped a little and almost Dropped the Woolen Blanket–– and we all heard a Tiny Mewing Sound come from Deep within the Folds of that Blanket. And that was You, Ryan. That was the First time we Heard you Speak. You were Crying and you were Scared and you were Cold that Morning years ago. Well, Ranger Jane Quickly Recovered from her Surprise at Meeting Someone so Early in the Morning on that Wet, Muddy Trail, and she said "Hi!" to your Mommy and Me. We, of course asked Ranger Jane what she was Carrying in her Blanket and Her Eyes Sparkled and She said: "Why, I've Found a Beautiful April Surprise!" And she turned down a corner of the Faded Green Woolen Blanket and there was the tiniest little Bear Cub we had Ever Seen–– it was You, Ryan. Ranger Jane said that she thought you were only a few months old and had Just Come Out of the Den where you and your Bear Mom had Slept all Winter and where you were Born. We all walked about a mile back to Ranger Jane's Cabin. As we came Close we Heard two Dogs Barking in Very Deep Voices. Woof! Woof! Woof!, they Boomed out into the Early Morning. Ranger Jane said, "That's Gandor and Hilti, my Greater Swiss Mountain Dogs." And with that Comment she Whistled and they Stopped Barking immediately. As we Approached Ranger Jane's Cabin we saw two Beautiful Large Black and Rust Colored Dogs with White Chests and White Muzzles. They had Bright Eyes and Gazed upon us with Intelligent Expressions. They did not Jump Up at Us nor Bark again and they Quickly went to Lie Down on the Shaded Wooden Front Porch when Ranger Jane made a motion with her Hands. "Come in." "Come in and Welcome", said Ranger Jane and she Motioned us to Sit Down in her Comfy Chairs. Ranger Jane offered your Mommy a Rocking Chair, Ryan, and asked her if she would Please Hold you while she went to Warm-Up some Milk for you. Your Mommy held you there in Ranger Jane's Cabin for the Very First time, Ryan. You were Sooo Cute! We enjoyed watching you as you Looked All Around the Cabin watching us and Trying to Figure Out what was going on. Soon Ranger Jane came with a Very Small Bowl of Warm Milk and she and your Mommy took turns Feeding you by Dipping their Fingers in the Warm Milk and you Sucked the Milk off the Ends of their Fingers. Soon, Much of the Warm Milk was in your Belly and your Eyes began to Close. A few moments later, you were Sleeping with a Smile on your Face and a little Drop of Milk Dripping down your Chin. As we All sat around Ranger Jane's Warm Fireplace on that Cold April Morning, Ranger Jane told us this Story: Every Day, Early in the Morning, it is part of Ranger Jane's job to Hike on One of the Hiking Trails in the Forest where she Works. She checks to see if the Trails are Safe for People to use because Many Things can Happen in a Forest. Sometimes Trees get blown down by a High Wind and Fall across a Trail and Ranger Jane has to go get a Chain Saw and a Helper and Cut the Tree into Logs so that the Trail can be made Clear again. Oftentimes, a Heavy Rain can Cause a Hill to get So Wet that the Soil turns into Mud and that Mud may Slide onto a Hiking Trail. In that Case, Ranger Jane has to mark a New Trail around the Mud Slide with Bright Yellow Caution Tape for the Hikers. Another thing that can Happen is that Large or Small Boulders may Roll Down from the Hills above the Trails. Sometimes these Boulders land right on the Trail and they Have to be Moved. This is why Ranger Jane Hikes one of her Trails every Morning. In one Week, she hikes each of the Five Trails that she is in Charge of in her Section of the Forest. As Ranger Jane was re-packing her Supplies into her small Backpack, she suddenly Remembered the Bear Footprints that she had seen on the Cliff Ledge Trail… "Oh! ", she said aloud to Herself with a Startled Expression –– "Those two Bears!" And with that Thought in her Head, Ranger Jane took the Difficult Way Over the Mountain to a Place that She Knew was on the Other Side of the Collapsed Cliff Ledge Trail. And when she came to the other side of the Trail…… there were Lots of Bear Footprints in the Wet Mud! But then Ranger Jane's Heart Jumped in Her Chest for a Moment… Lots of Really Big Bear Footprints in the Mud just on the Other Side of where the Cliff Ledge Trail had Collapsed –but No Really, Really Small Bear Footprints at all! And –even More Puzzling – even the Big Bear Footprints Stopped near where the Trail had Fallen into the Lake. The Really Big Bear Footprints did NOT go Further On Down the Trail at All! Mystified, Ranger Jane turned around and began to Follow the Muddy Trail down the Mountain to where it Leveled Out and Followed Close By the Edge of the Big Lake. The Trail ran through the Dense Woods alongside the Lake, Ryan, and every few hundred yards, it would come right up to the Sandy Shore where the Edge of the Big Lake curved to meet the Trail. And in the Bright Early Morning Sunlight, on one of those Sandy Shorelines, Ranger Jane saw a Very Large Bear. Carefully, and Slowly, Ranger Jane Approached the Bear Lying on the Shore at the Edge of the Big Lake – for One had to Be Careful around Bears in the April Springtime – as they were often Momma Bears with their Cubs and they would try to Protect their Cubs by Standing Up Very Tall, Roaring a Huge, Terrifying Roar, and even Sometimes Chasing People Away Through the Forest. So, Ranger Jane was Very Careful and Cautious in Approaching the Very Large Bear lying in the Sand by the Edge of the Water. But, –as Ranger Jane got Closer and Closer, she Noticed that this Bear was Not Moving. This Bear was Very Still. And Ranger Jane moved even closer… and there on the other side of the Momma Bear's big head was a very small bear cub. The bear cub had its nose and most of its face pressed into its Momma's fur near her neck. And the bear cub wasn't moving. Ranger Jane now reached down and touched the Momma Bear. Her fur was warm in the early morning sun, but she did not stir. Ranger Jane reached deeper into the Mamma Bear's fur and touched her skin near her neck… and still she did not move at all. An icy feeling went through Ranger Jane at that moment, Ryan – for she had a very bad Feeling about this bear. Ranger Jane knelt down right beside the very large head of the Mamma Bear at the edge of the lake and she used her hands to open the bears eyelids and to feel if any air was coming from this big Bear's nostrils. The Bear's eyes did not blink and there was no air coming from the Big Bear's nose. Ranger Jane tried to lift a big, heavy, front Paw and she lifted it a little bit and when she let it go, the Bear's paw just dropped hard onto the sandy beach. As Ranger Jane feared… this Momma Bear was Dead. Now, Ranger Jane went over to the other side of the Mamma Bear's big head and looked at the little cub. This cub was not dead for its front paws were now moving and stroking the hair of it's Momma's Neck. And it's little head was moving a bit as the little bear pushed it's nose and face as far as it could into the deep, long fur around it's Mother's neck. The sight of this made Ranger Jane feel sad. In fact, she felt doubly sad –– sad for the little bear cub that was trying to hide it's head in it's Momma fur… and sad for the fact that the Momma Bear was dead. Well– yes– Ranger Jane was indeed sad… very sad… but, she was trained to Take Action to help make any situation she encountered Better or Safer. So, she took off her small back pack and emptied everything out of the top of it – until at the very bottom she touched what what knew was there. It was half of an old woolen green Army blanket that Ranger Jane carried in case of an emergency. She could partially cover someone may need to be kept warm from the cold or she could fashion the blanket into a sling for a hurt or broken arm or leg… in fact, she could do many things with the old, small, half-blanket in an emergency. What Ranger Jane did with it now was to use it to pick up and dry off the little bear cub lying by it's Momma's head near the edge of the water. The bear cub's eyes were squeezed closed and it kept moving its front paws like it was reaching out and trying to touch it's Mom. Ranger Jane bit her lip and she felt the tears come to her eyes as she gently dried the little bear cub's fur. 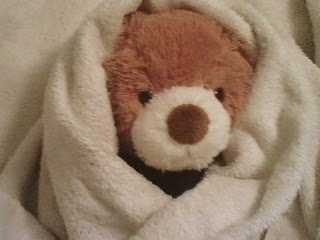 Finally, she turned the blanket inside out so that she could use the dryer side to wrap around the little bear cub. 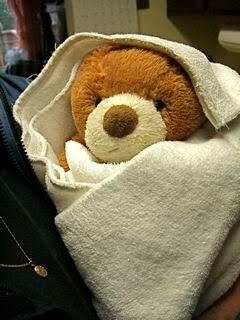 She wrapped the bear cub tightly and held it close to her chest. And than she sat down to Think. On a Log that had washed up onto the Shore, Ranger Jane sat there Holding the Tiny Bear Cub and Looking at it's Dead Bear Mom. Ranger Jane was a well-trained Forest Ranger with many years of Experience. She used her experience and her training as she Reviewed in her Mind, what May have Happened earlier that Morning, Ryan. Ryan, so that you can Understand Better what May have Happened, it's Important for you to know some Facts about Wild Bears in their Natural Environment. Ranger Jane believes that while your Bear Mom was moving you and Herself to a Dryer Place that Wet April Morning, that a Terrible Accident Happened. In Nature, Ryan, things are Never Still. Something is Always Changing. Sometimes these Changes are Good, Sometimes these Changes are Neutral (neither good nor bad) and Sometimes these Changes are Bad for Someone or Something. Kind of like when a Large Old Tree blows down in a Storm in a Forest, Ryan… the fallen Old Tree will make Room for many Younger Trees to Grow Up in the area where the Old Tree was because a New, Sunny Spot, will Occur where the Shade from the Large Tree's Leaves and Branches made it Impossible for Younger trees to get Lots of Sunlight that they Need to Grow. So– that's a Good Change. If the Large Old Tree Falls and does not Hit Anything and Knock it Down and Hurt or Kill it, then that's a Neutral Change. And now, for Example, if the Large Old Tree is Blown Down in a Big Rainstorm and it Falls and its Trunk Deflects some Rainwater Downhill kind of like a Stream, and some of that Water runs into a Bear's Den and starts to Flood it (like maybe what happened to you and your Bear Mom) then that is a Bad Change. And of course, the Wind Blowing down the Old Tree is a Bad Change for the Old Tree… but that is just one of the Several Ways that Old Trees Die, Ryan. Everything in Nature Comes – and Stays for Awhile – and Goes – Everything that's Alive Lives and Dies. Now, Ryan, Ranger Jane Stopped her Story right here to tell us this: "Everything from here on in is just a Guess, because I have No Evidence like Tracks to tell me the Facts. But something like This must have Happened": as her Little Bear Cub was Floating Away Through the High Waves Toward the Center of the Big Lake, the Bear Mom Swam out to Rescue her Cub. Although Adult Bears are Good Swimmers, the High Waves and the Strong Wind Must have been Very Difficult for Her to Overcome. I'm Sure that she Tried Extra Hard to Reach Her Little Bear Cub so that She could Take Him Back to Safety on the Shore. We Know for Certain that she Reached Her Cub and that She Swum Back Pushing her Floating Little Cub through all the Strong Wind and the High Waves. This we KNOW this because I Found Mamma Bear and Her Little Cub at the Edge of the Water along the Sandy Shore. What we will Never Know for Certain is How Very Hard, and how Valiantly She Struggled, and How Difficult it Was for Her to Push Her Frightened Cub Towards Shore while Swimming through the Stormy Lake. She Must have Breathed-in too Much Water into her Lungs while She was Struggling and Swimming. Water in Lungs is Quite Bad for a Bear or for Any Animal other than a Fish. It will Make You Deathly Sick very Fast! I can only Guess, said Ranger Jane, that the Momma Bear Tried Extra Hard to Keep Her Cub's Head out of the Water and that She Swam as Hard and Fast as she Could with Her Cub Toward the Shore. All the Time, she was being Splashed by Fierce Rain and Water from High Waves on the Big Lake. The Mamma Bear must have just Breathed-in Too Much Water and That was Very Bad for Her Lungs. She Just Managed to get Her Little Cub to Shore and She Must Have been So Very Glad and Relieved. But She was Exhausted from Her Heroic Efforts and She Was Very Sickened by the Water that She had Breathed into Her Lungs. The Mamma Bear just Lay there at the Edge of the Lake with Her Little Bear Cub Safe near her Head and She Died there. After Awhile, your Mommy Looked up from Watching you and she Softly Asked Ranger Jane if We could Perhaps take you to Our Home and Raise you. Ranger Jane Looked at us for a Long Time in the Fire Light before Answering our Question. You see, even though Ranger Jane Knew us as Nice People, she Still had to Make an Important Decision about Us. She had to Decide if we were Able to be Good Parents for a Little Bear and that We Would Always Treat You Well. Ranger Jane asked us Many Questions– did we have Dogs or Cats or other Animals that Could Hurt a Small Bear Cub? We said, "No." She asked us if we would Always take the Best Care of You No Matter What– and we said "Yes, we Would." And Ranger Jane asked if we would Take you Everywhere With Us so that you would 'Always Feel Safe', for you had just had such a Sad Experience with your Bear Mom's Death. We talked Softly and Quietly while you Slept and as the Late Morning Sun began to slowly Warm the Air of the Forest, Ranger Jane Decided that we would be Good Parents to You– and that Living with Us would be Much Better than Sending you to Live in a Zoo– for we Talked about That too. Finally, Ranger Jane asked us, "What are you going to Name Him?" And your Mommy Immediately said 'Ryan' because that was the surname of our Friend, Ranger Jane, who Found you and your Bear Mom at the edge of the Lake. Ranger Jane Ryan Found You and Rescued You and so your Mommy Named You Ryan in Her Honor. Ranger Jane had Tears in Her Eyes and she said that she Felt that she had Made the Best Decision that she Could about You and that she Hoped you would Grow Up to be Big and Strong and Loving and that you would be a Happy Bear with your New Family. That's the Story of your Bear Mom, Ryan. And that is the Story about How you Came to Live with your Human Mommy and Daddy. You were Far Too Young to Remember much about this, Ryan. This Happened a Long Time Ago, and your Mommy and I have Loved you for Years and we will Always Love you Forever. We have never Hiked with you along that Forest Trail Beside the Big Lake Where you were Found. We believe that even though you were Quite Young at that time–– it might bring back Very Sad Memories. I Promise that we will Visit the Trail near where Ranger Jane Found you and your Bear mom when you are a bit Older. We'll Also have you Meet Ranger Jane Ryan, too. I Know that she will be So Happy to See that you have Grown into a Fine, Brave, Strong, Intelligent, Handsome, Loving, and Happy Young Bear. Ryan, Bear Dads are not like Human Dads. They do not Stay and Live with Bear Moms. Bear Dads go and Roam the Forest and Protect Bear Moms from Afar. But your Bear Dad Certainly could NOT Protect your Bear Mom from a Violent Spring Storm. Sometimes, Ryan, Very Sad Things Happen for NO REASON. That is Just the Way of the World, Ryan. However, since we Hike a Lot, we may Meet your Bear Dad in the Forest one Day. I'm Certain that he would Recognize you Ryan. Thank you Daddy. I'm going to Sleep now. This story is dedicated to Susan Lorenc Haluska– Ryan's Mommy–– whom Daddy and Ryan Love with all our Hearts.